Get the right design specs for your campaign. Consult with the person booking the campaign to get the size (or sizes) of design creative required for producing your billboard on flex-face vinyl. The design template or templates for production-ready creative differ depending on the size of the billboard location or locations in your campaign. Take a peek at our billboard advertising tips. Select and download the correct template/s for the size of the billboard/s in your campaign. As a rule of thumb, billboards in Victoria and Prince George are 10'x20' in size. 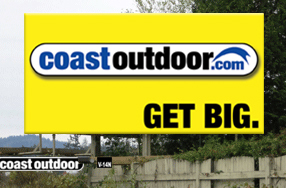 In Cowichan and Nanaimo, billboards are 10'x24'. There are a number of exceptions to this rule of thumb. Our digital billboards in Duncan Cowichan (X-031S and X-032N) display 360px wide x 168px high, "maximum quality" RGB .JPG files. Our digital billboards in Nanaimo South (X-041S and X-042S) display 721px wide x 361px high, "maximum quality" RGB .JPG files. Our digital billboards in Nanaimo (X-043S and X-045S) display 360px wide x 168px high, "maximum quality" RGB .JPG files. Our digital billboard in Victoria (X-011N) displays 360px wide x 168px high, "maximum quality" RGB .JPG files. Because some e-mail programs re-compress .JPG images and reduce quality, we do not suggest sending digital creative to us by e-mail. Please submit digital creative using our file transfer service. For other ParkAds locations, please speak with your account executive. It is also helpful to include a small, 72 dpi RGB .jpg proof (eg. 2500 x 1250 pixels for a 10'x20' creative) of your design for our reference. A low-res .pdf is also acceptable for the reference proof.